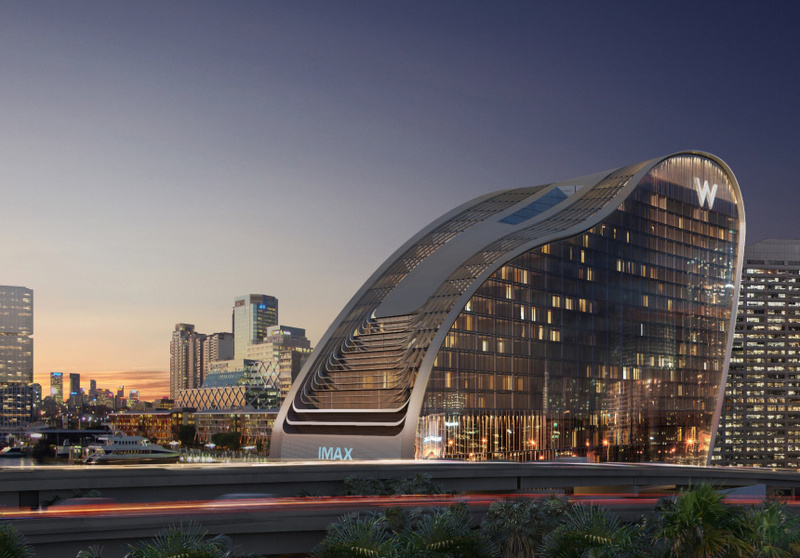 The luxury hotel will open in Darling Harbour in 2020, complete with 593 guestrooms, a cocktail bar, restaurant, gym and upgraded IMAX theatre. What was once the site of Sydney’s IMAX theatre is undergoing a $700 million transformation. By 2020, the under-construction snail-like glass monolith in Darling Harbour will be a luxury W Hotel (an offshoot of Marriott International) with the Star Casino complex, ICC theatre and Sea Life Aquarium for neighbours. Dubbed “The Ribbon”, the W Sydney will feature 593 guestrooms, and serviced apartments, alongside a range of entertainment facilities, including the “Wet Deck” (an infinity pool overlooking the harbour) and the “Living Room” (the brand’s popular cocktail bar). You can also expect a restaurant, two bars, a gym, spa centre, plus 925-square-metres of event space for conferences and social occasions. The old IMAX theatre will also be retained, and get a revamp. 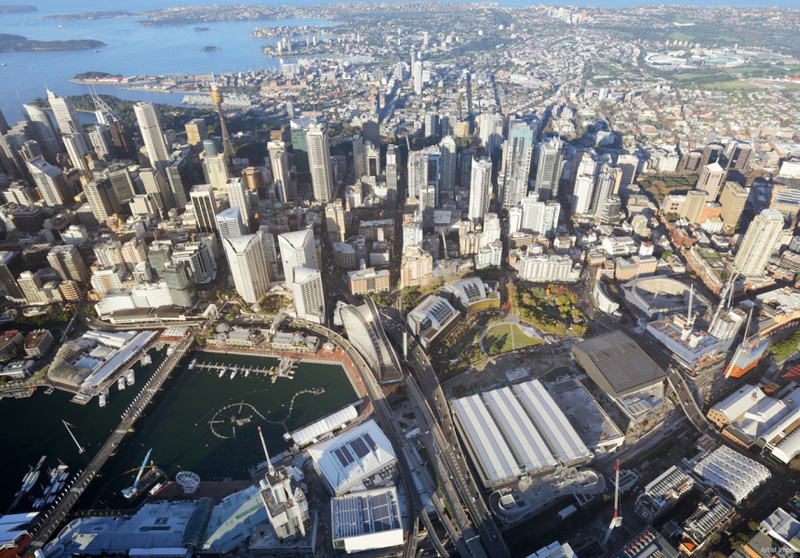 “Darling Harbour is going through a rejuvenation – [it’s] an exciting time. 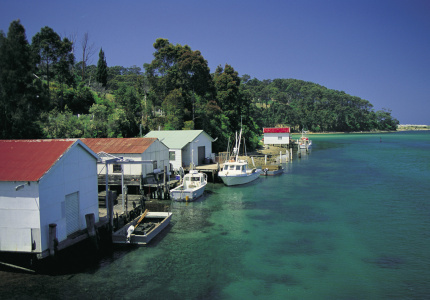 It is repositioning itself as Sydney’s premium tourist destination with a mix of leisure and business travellers,” Richard Crawford, senior director of development for Australia and New Zealand at Marriott International, tells Broadsheet. 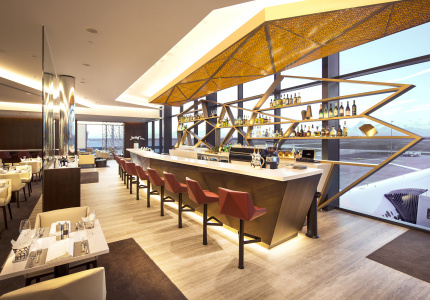 “[The launch of the W Sydney] symbolises the changing landscape of hotels in Australia. 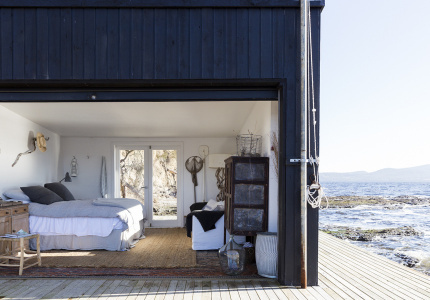 We are moving away from legacy hotels that lack imagination to the tomorrow hotels that hit the millennial mindset of travelling,” Crawford says. W Hotels Worldwide is one of the world’s largest luxury hotel chains – with 78 outposts around the world, greeting guests in Bali, New York, London and Hong Kong. Brisbane’s W Hotel opened in June this year, with Sydney now soon to follow. Umbrella company Marriott International also plans to launch a W Melbourne in 2020, as well as a Ritz-Carlton, both still under development. Mildly eccentric with tongue-in-cheek designs, W hotels are known for catering to a slightly younger demographic – with pools that transform into heaving parties and “high energy” social spaces. And the time is ripe to flirt with an Australian audience – Sydney has seen a deluge of hotel openings recently, from Paramount House Hotel in Surry Hills to the Sofitel Sydney Darling Harbour. Built and developed by Grocon and funded by the Greaton group, the W Sydney will sit inside a commanding 25-storey high-rise development designed by the award-winning architecture firm HASSELL (also behind Sydney’s Olympic Park and North Ryde railway stations). “The Ribbon” development will also provide pedestrian links across Cockle Bay and from Darling Harbour to Darling Quarter, and come with 1799-square metres of retail space. 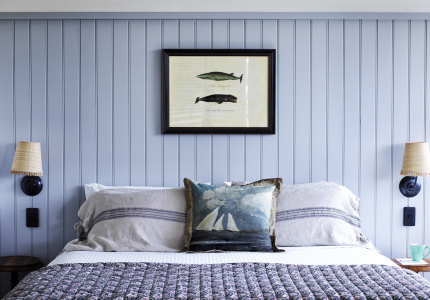 Sydney is no stranger to this hotel chain. The original W Sydney in Woolloomooloo was converted into the Blue Hotel under Taj Hotels and Resorts in 2007 and, more recently, rebranded as Ovolo Woolloomooloo. “We are excited to be back. We see a lot of Australians gravitate towards the brand in our Bali and US locations,” says Crawford. 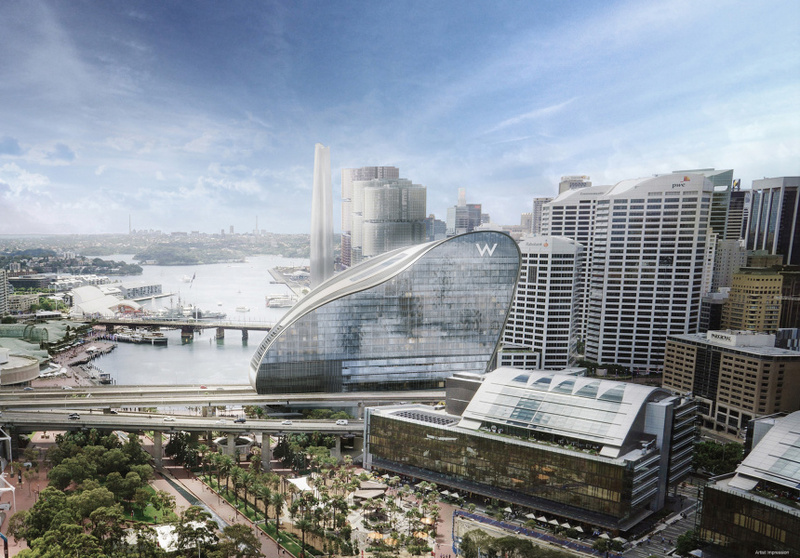 The W Hotel is slated to open in Darling Harbour in 2020.